I love when brewers get batshit crazy and make beers that buck style and try to create something fun and delicious. Notice I didn't say "I love to drink..." because lets be honest, six beers in, drunken brainstorming of ideas of malt and hop combos, or what to throw in the fermenters followed by oohs and ahhs are fun until you actually drink that I'd swill and realize that the Germans may be onto something with their strict beer laws. For a creative beer to be successful it has to have three things: 1.) A base ale that is actually good on its own 2.) Flavors that make sense to the most sober of Debbie Downers and 3.) Artistry. 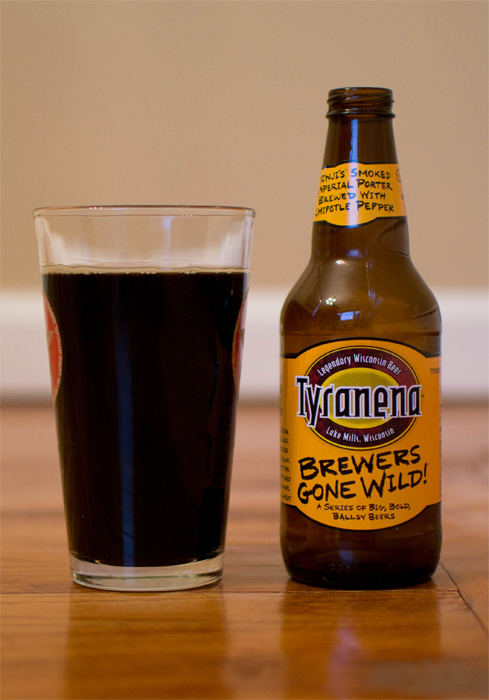 Tyranena's Brewers Gone Wild series has been doing a good job of nailing all three of those things and making my liquor store trips way more fun. Benji's Chipotle Smoked Imperial Porter is exceptionally dynamic and surprising with its exceptionally nuanced flavors. It poured black and the head was extremely interesting. It was like a root beer float. Foamed up, and as fast as it fluffed up, is fell apart into a thin like of lacing. When I got a good whiff, it was full of chocolates and malt and smoke and.... no pepper? Most pepper ales I've had have been like snorting Stake'n'Shake pepper juice, so I was worried how the taste would lay itself out. My first reaction was that this was a really good imperial porter. Chocolatey notes, mixed with deep, smooth, and creamy malts. It was like porter ice cream and the smoke was just enough to help enhance those flavors. Too many times I shy away from smoked beers because I'm not a big fan of drinking campfires, but this was a great example of how smoke can smooth a beer out and help combine those big beer flavors. As the beer was on its way out, its friends Booze and Chipotle showed up. The most surprising thing about this was how there were so many flavors and they were all combined so subtly it create a nuanced beer that is billed as "a series of big, bold, ballsy beers." All the flavors were soft, but wrapped together, left you with a rich and warm feeling, so yeah, this beer is camping, and I'm okay with that. Word of advice: Let this sit out of the fridge for 10-15 minutes. A little warmth and air really bring out those subtle flavors some more. I give it a 4.5 out of 5. Sheer artistry in this one. O-Dawg: Smoked Coffee nose with a little Mexican heat at the end. Tasty and balanced overall. Easy choice to give it a 4. If you are looking for a similar character only in an IPA I would suggest Hatch Blower by Triton Brewing.